Uniworld boasts over 40 years of experience in the river cruise market, and more than 70 years in the travel industry under The Travel Corporation. As river cruise lines look to capture a younger market with healthier onboard dining options, more active excursions and fitness programming, Uniworld sought to fill this niche with U River Cruises (note the name change from U by Uniworld, as of March 2019). Expect the same Uniworld staff onboard, but with the addition of two dedicated “U hosts” from sister brand Contiki, who will lead the way everywhere from nightclubs in Amsterdam to rock climbing in Bamberg, Germany. 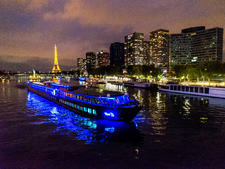 The all-black, reimagined "A" promotes youthful programming and decor for a hip take on river cruising. U River Cruises is meant to be a line where Instagram moments are made. Two sister ships are designed to be “part boutique hotel, part yacht and part resort,” with stylish staterooms, rooftop morning yoga sessions, two bars, a rooftop lounge with local DJs, and free Wi-Fi. Meals are inspired by the street food of cities you’re cruising through (with craft brew to match), in addition to comfort food crafted by celeb cookbook author Bea Tollman. Master bartenders lead the way with onboard mixology courses, and passengers can capture scenery in more than just a photograph with Wine & Paint classes, which include a glass of local vino. Nights don’t end when you get back onboard, either. Passengers can keep the party going on the rooftop lounge or at the silent disco with the ship’s resident DJ. Since excursions start later in the day, passengers have plenty of time to sleep in after a late night out. 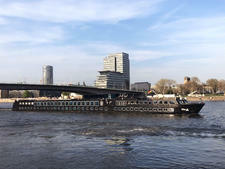 Initially designed as the first river cruise catering to younger travelers, U River Cruises features more experiential itineraries that allow passengers to really connect with a city and the people who live there, thanks to locally driven activities like pretzel-making classes with baker masters in Miltenberg, Germany. Onboard, the ship feels like a boutique hotel you’d find in any capital city across Europe, with modern public spaces, communal dining tables, a street food-inspired culinary program and a nightclub. The first two sister ships, The A (formerly Uniworld’s River Ambassador) and The B (formerly Uniworld’s River Baroness), will debut in April 2018 with 61 rooms accommodating 120 passengers. The A originally launched in 1993 and The B in 1994, but both were renovated in 2011. Staterooms on both ships will remain the same size, measuring 128 square feet, and suites will measure 256 square feet. The main differences following the recent renovations will be the all-black exteriors, and sleek, modern decor extending from the communal spaces and rooftop lounges into the Studio, Suite and Balcony rooms.